Welcome to the prestigious Avoca co-op suites surrounded by vast parklands. This highly prized location offers it all! The St. Clair subway station, shops of Yonge & Sobeys grocery store all conveniently right out your front door. ​1. Location! Location! Location! Walking distance to everything, there really is no need for a car. Nearby TTC, parks, library & shops! Rated Toronto's #1 neighbourhood. ​2. 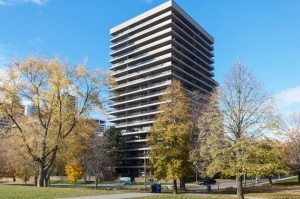 Sunny & bright south west facing 2 bedroom 2 bathroom renovated corner suite. ​3. Over 600 square foot wrap around balcony with the most beautiful park & city skyline views! It really feels like having a yard without all the work. Entertain indoors or out! ​4. The apartment has a charming and comfortable feel with a cozy fireplace to enjoy on cold winter nights. ​5. All inclusive maintenance fees, including property taxes & bulk TV package allows for easy budgeting. ​6. Many social activities & events organized including movies & bridge, which provides entertainment and a sense of community for the residents. ​7. There is a pleasant level of interaction amongst the suite owners. ​8. The co-op format allows you to participate at board meetings so you are always up to date with all important decisions & changes. ​9. Building amenities include a quiet fitness area, library, and large underground parking space with a convenient car wash station. Handy Andy's dream 400 sq ft work shop with approximately 80 members (donated from a member who was an accomplished boat builder and cabinet maker, the workshop has just about every tool you could ask for with a heavy duty dust gathering machinery). ​10. Well run building with professional property management by Brookfield including excellent on-site 24 hour concierge & security. Located just south of St Clair, east of Yonge Street just off of Pleasant Blvd one of Toronto's most preferred neighbourhoods -- nearby Moore Park, Forest Hill & Summerhill! Situated right across from David A. Balfour Park & Trail! A 20.5 hectare park featuring a large open space on a reservoir , ornamental fountains, reflecting pools, gated garden retreat, and a children`s playground. The park overlooks a forested ravine that is a tributary to the Don River. Trails lead down into the ravine and connect to the Kay Gardner Beltline Trail. Welcome to Suite #906 at 20 Avoca! 1100 square feet -- move in ready! Enter the gracious foyer with rich dark refinished parquet floors throughout and a mirrored wall. Powder room with stone floors and granite counters is situated ideally for guests. Double coat closet and a linen storage closet. Expansive open concept living room is perfect for downsizers with lots of furniture. Cozy built-in electric fireplace & mantle is flanked by bookshelves and convenient storage. Principal rooms are flooded with natural light from south west corner floor to ceiling windows. Sliding doors lead out to the terrace. Bright & spacious dining room is located right off the kitchen. Renovated kitchen is terrific to work in. Modern upgrades include granite counters , tiled floors for easy clean up, pot lights, tiled backsplash and plenty of cupboard space. Master retreat fits a king size bed and has floor to ceiling windows to soak in the west sunset! Large double closet plus separate linen closet. Renovated 4 piece ensuite with marble counters , tiled floors, glass enclosed shower and Jacuzzi style soaker tub, chocolate brown cabinetry with space for towels & toiletries. The 2nd bedroom/den is a good size. Sliding glass doors lead out to the wrap around Terrace and closet. Set up currently as a den, but easy to convert back to more private bedroom. 600 + square feet of outdoor living space! Enjoy dining, entertaining and relaxation on the huge repaired and improved wrap around covered terrace with stunning views. Ideal abode for "empty nesters" coming from a house, or professionals looking to live in a prime central location. The Avoca co-op complex consists of two towers #10 & #20 surrounded by the greenery of Rosehill Reservoir, David Balfour Park & Ravine. Amenities include: Outdoor pool, recreation room, exercise room, sauna, 24 hour concierge, security system, car wash, visitor parking and laundry room & wood working shop. Rentals are prohibited. All suites are owner occupied. Pets are not allowed, nor are ensuite washers and dryers. Lovely, bright laundry room has newer machines. Parking is all rental, and costs $70 per month. Maintenance fees of approximately $1.32 per square foot and cover all utilities, bulk TV package, heat, hydro, central air conditioning & property taxes (except parking). All balconies have been fully repaired over 2 years, bonus for new owners to not have to go through that process.